Make sure you're always the first to know when your site goes down. Try free for 14 days. Never miss a thing again. 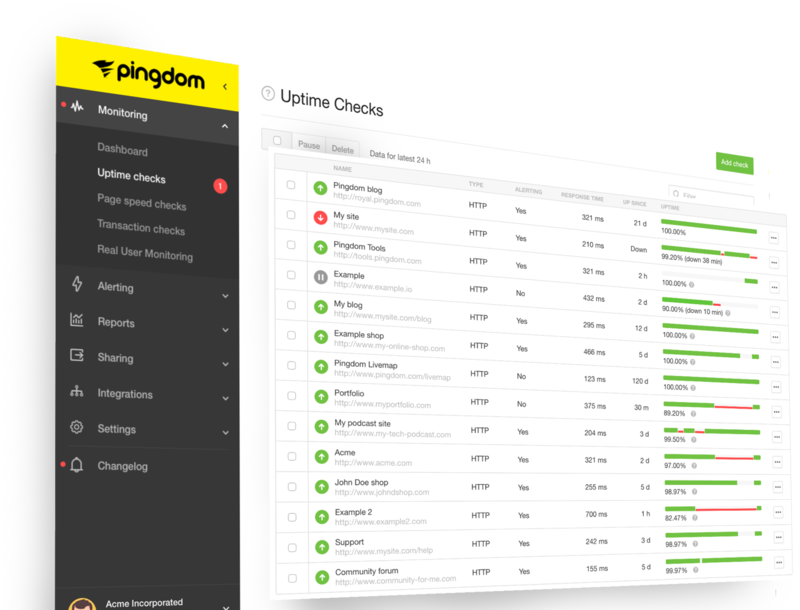 Pingdom’s Uptime Monitoring includes these essential features. We monitor your site around the clock to verify that your site works, by automatically testing it from 70+ locations globally. Get the information you need to analyze and solve the issue. When your website becomes available, we’ll notify you again. Make data-driven decisions on site improvements with easy to understand reports, delivered via dashboard and email. Not at your desk? No problem. Our apps for Android and iOS allow you to view important data, alerts and statuses, on the go. Ideal for personal sites or blogs when performance is as important as uptime. The all-inclusive suite. For when you want to get serious about monitoring. © 2019 Pingdom AB. All Rights Reserved.